This video addresses the importance of efficiency in providing power to an increasingly large global population. Consider using the Switch website to have students do a research project on the pros and cons of different types of energy sources. Then, as a class they can create an energy portfolio. Note that this website will play multiple short videos. Instructor may want to review and choose videos of interest in the series. 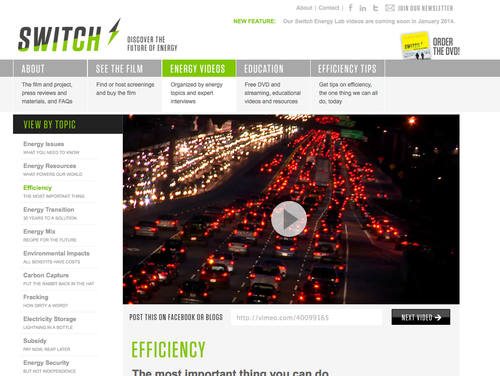 The video describes how efficiency reduces energy imports and helps stabilize prices. Issues around increasing the efficiency of power plants are discussed as well as the problems that accompany this process. This video is a segment of a feature documentary entitled Switch. Dr. Scott Tinker, Director of the Bureau of Economic Geology and the State Geologist of Texas, narrates the video. Switch is part of the Switch Energy Project, a multi-pronged effort designed to build a balanced national understanding of energy. Supporting educational resources are provided on the website. Some economics vocabulary may need to be defined, e.g. "incentivize", "supply side". This video is also available on [link http://vimeo.com/channels/303773]. Links to other useful resources on different issues and topics are provided on the website.